Bobby and Georgia live in a normal house with their mum and their dad and their pet dog, Rory. But in that house, there’s a whole world going on that they know nothing about… the world of the greeblies! 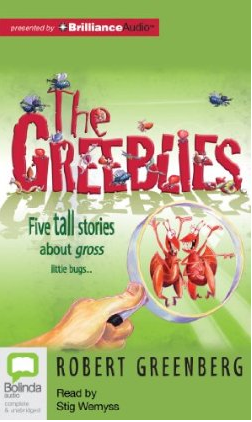 Greeblies like Hemi the bedbug, Spritzer the dust mite, Darren the blowfly and Nick the tick. Five of the funniest (and grossest!) stories you’ll ever read – complete with lots of disgusting bug facts – The Greeblies is about all those itchy little critters that live right under our noses (and in our hair!). 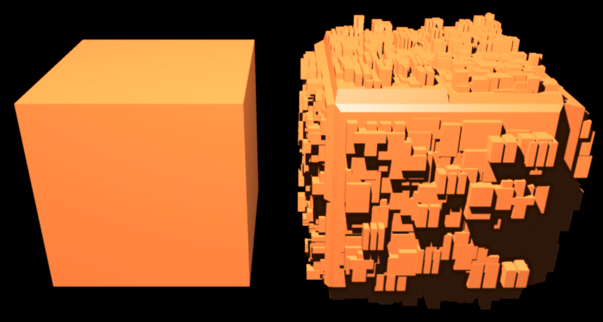 A greeble or nurnie is a fine detailing added to the surface of a larger object that makes it appear more complex, and therefore more visually interesting. It usually gives the audience an impression of increased scale. The detail can be made from simple geometric primitives (such as cylinders, cubes, and rectangles), or more complex shapes, such as pieces of machinery (sprockets, cables, tanks). Greebles are often present on models or drawings of fictional spacecraft or architectural constructs in science fiction and is used in the movie industry (special effects). A technique used in Lego building is also called greebling. … The earliest recorded use of the term “greeble” found to date was by those working on the special effects for Star Wars — the group who would later become Industrial Light and Magic. They also described this design method as “guts on the outside”. Ron Thornton is widely believed to have coined the term “nurnies” referring to CGI technical detail that his company Foundation Imaging produced for the Babylon 5 series. Now, why are greeble and greeblie so likely to be invented in senses like the ones above? Because of the sound-symbolic values of the components of these words. First, smallness. This is encoded twice in these words: in their unaccented final syllables, with C plus /ǝl/ (spelled le) or /li/ (spelled lie or ly) — compare the Tribbles from Star Trek — and then in their accented vowel, /i/, a high front vowel famously associated with smallness (there’s a huge literature on the size-symbolic values of vowels according to the frequency of their second formants, and /i/ is pretty much as little as you can get). That leaves the contribution of the onset cluster gr- in the first syllable. Here the scholar of these matters is John Lawler, in collaboration with others, especially Rich Rhodes. Lawler’s homepage has material specifically on the phonosemantic values of onset clusters (under the name “assonances”). His most recent table of “coherent” assonances — those statistically associated (in the English lexicon) with specific referential content — has entries for gl-, kr-, and br- and dr-, but not gr-. However, something less than significant statistical association to very specific semantic content might nevertheless play a role in word invention, if certain existing words can serve as especially potent contributors to the innovations. I think this is the case for the gr- suggesting negative emotional affect that we see in greeblie: gross and grody are likely contributors, as are grotesque / grotty and grungy. Maybe grim, grimace, gripe, gremlin, grisly, or grizzly as well. That should be enough to make greeblies not only small, but also annoying or even nasty. This entry was posted on December 23, 2012 at 11:24 am and is filed under Phonology, Sound symbolism, Words. You can follow any responses to this entry through the RSS 2.0 feed. You can leave a response, or trackback from your own site. My family does not use the word greeblie, but two friends from high school, a brother and sister from the same family, used it to refer to green beans. Greeblie or greebie? I’m totally familiar with the latter (it’s a telescoped clipping of /grinbin/ to /gribi/), but I could see how you’d get to the former.